I had posted this project in the Forum section of this site as I was designing and building my system. Here is what I started with. 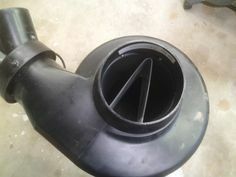 A basic Jet DC1100 Dust collector. After a ton of research I settled on the Oneida Super Dust Deputy with a 5” inlet. 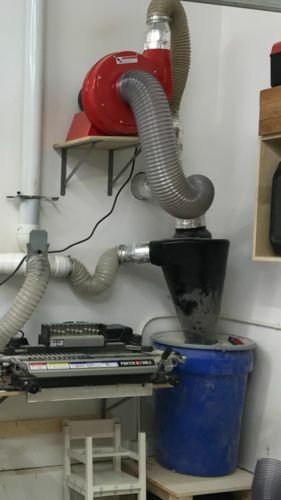 I stacked the blower from the DC1100 on top of it and mounted it to the wall. I knew I wanted a small barrel so that I never had to worry about it getting too heavy for me to lift. I also wanted flexibility between the lid of the barrel and the bottom of the SDD so I added a support to hold the SDD in place and added an 8” long section of 6” flex hose. That got me to this point. It was now time to chose ducting and fittings. 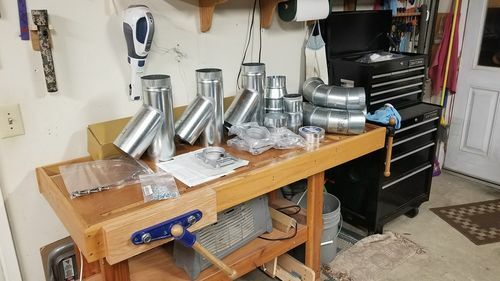 I chose 5” ducting and fittings from Oneida. Oneida recommends 5” duct work with this set up and so that’s what I did. They recommended at least 5’ of straight duct before entering the cyclone, That worked out well for me. I also took the advice of “Carl10” and added a baffle in the cyclone itself. His research showed that I might gain as much as 8% more efficiency by correcting the direction of the air flow to match the flow inside the cyclone. It also helps reduce noise levels. 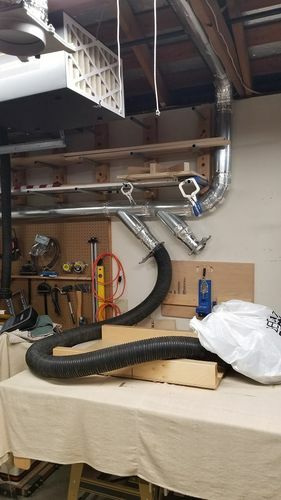 After adding the 5’ of straight ducting I added my fist of 3 wyes. Two of them reduced down to 4” for the Jointer and the Bandsaw and the third remained at 5” for the drop to the table saw. 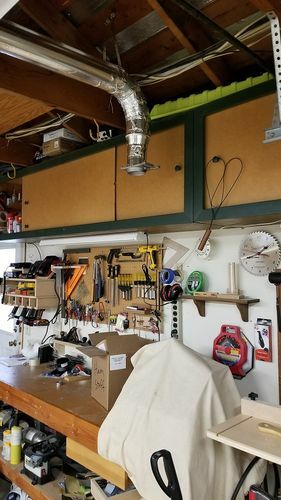 The final piece was a 15’ run from the table saw drop across the ceiling of the garage and down to the Spindle sander. 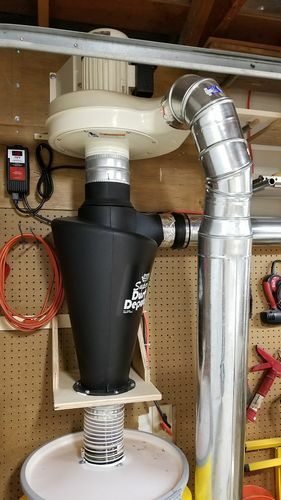 I vented the exhaust of the SDD outside via a 6” dryer vent. I have several bushes right by the vent and I have yet to see any sawdust build up on them which leads me to believe that I am capturing the dust I am collecting better than I was previously. 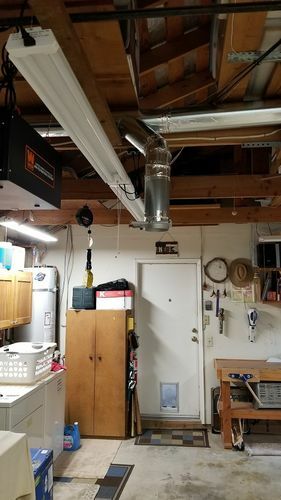 I also run a WEN air filtration unit that hangs from the ceiling. After 6 months of use I am pretty satisfied with this little set up. 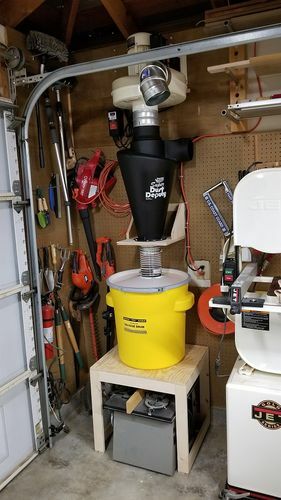 I haven’t had any issues with either the Jointer or my Plainer clogging up the ducting so I am going to give this set up a thumbs up. I’m sorry I didn’t get a picture of everything all hooked up and running but my wife parks her car in the middle of my shop every night. Thank you all again for your kind comments and advice during my barrage of questions. You are a valuable resource for amateur wood workers like me. The baffle inside the cyclone is the only thing that baffles me. I’ll have to look into that before I get mine put together. The baffle inside the cyclone is the only thing that baffles me. I ll have to look into that before I get mine put together. The way it was explained to me is the air coming in is spinning one direction and the air in the cyclone is spinning the opposite direction. When they collide energy is wasted as one stops the rotation of the other and then begins to spin it in it’s direction. That wasted energy causes a loss of CFM’s and also makes a lot of noise. I could definitely tell the difference in the sound when I added the baffle but I don’t really have a way to measure the efficiency. Nice work! I’m planning on purchasing a SDD soon and change up my system. I wanted to ask for some reference links for the Air straightener baffle thingo you speak of. Thanks! Nice work on this, great set up. I haven’t heard about the baffle idea, I’m going to have to check that out. I have a similar set up for those interested. Finding a good deal on the blower itself proved more difficult than I expected. Needed something 110 and for a good price considering I didn’t want the filter etc. Ended up finding this unit through PSI which sells just the blower itself. Nice work! I m planning on purchasing a SDD soon and change up my system. I wanted to ask for some reference links for the Air straightener baffle thingo you speak of. Thanks! Here is the link to the thread. It’s kind of long but you’ll find it in there. This dust system is so nice. You did a great job on this system. Congratulations. Nice job fivecodys!! What is the noise level like outside your house at the exhaust vent? I am tempted to exhaust to the outside but I am hesitant because of the noise. It’s pretty noisy but my neighbors garage is in between his house and mine and he said he can’t hear it when it’s on so I’m ok. He is a wood working guy too so he is cool with all the noise I make. I used to work with the garage door up anyhow so it’s not much different. Thanks Charles. I had a lot of help from you guys.